Ships tomorrow if ordered in the next 5 hours and 8 minutes! With 20 buttons, the Logitech G600 MMO Gaming Mouse is the most customizable and easy-to-use mouse specifically designed for mastering your favorite MMOs. Whether you're out to burn down the boss or are in the heat of a PVP battle, this mouse gives you new power to execute every action with lightning-fast accuracy. *Measured on popular cloth and plastic gaming mouse pads. Specifications may vary depending on surface. **Measured on a wood veneer desk. Specifications may vary depending on surface. 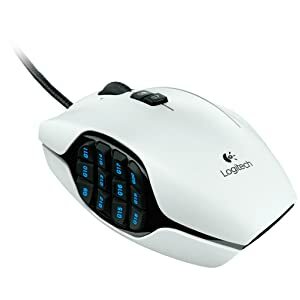 Review "Logitech G600 MMO Gaming Mouse - White "